If you regularly think positive thoughts about being debt free, can you use the Law of Attraction to get out of debt? 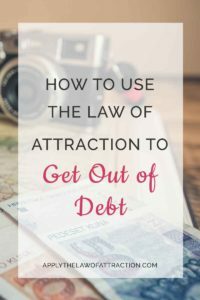 Is that all there is to using the Law of Attraction to pay off debt…or is there more to it than that? Is the Law of Attraction really a practical tool to stop the downward spiral of debt? Whether you're new to the Law of Attraction or have been practicing it since before “The Secret” came out, the Law of Attraction helps you to create a powerful mindset that can help you get out of debt. Everything in the world is energy. Each thing has its own vibrational frequency. You have a vibrational frequency. Money has a vibrational frequency. Debt has a vibrational frequency. As you match the vibrational frequency of things, you draw them to you. If you have debt, you currently match the vibrational frequency of debt. You need to change your vibrational frequency to match being debt free and to match the frequency of money. 1. Your thoughts. Chances are that you currently think about the debt you do have. You might wonder how and when you'll ever pay it off. This is the worst thing you can do because you're only drawing more debt to you. Each time you have these thoughts, you're shifting your vibration to one of being in debt. All your thoughts are self-fulfilling. By thinking of being in debt, you're using the Law of Attraction to keep you in debt. 2. Your feelings. Your feelings have the power to create, and they are the primary indicator of what you are creating in your life at any given moment. Your feelings tell you if you are using the Law of Attraction to get out of debt. When you feel good, you are attracting being debt free. More money and opportunities come to you in order to help you pay off debt. You can't think that you'll feel better once you are debt free. You have to feel good now so that the Law of Attraction can get you out of debt. Feel good first and things will change for the better. When you feel overwhelmed, downtrodden, or disappointed, all you can see are problems. When you feel uplifted, joyful, and happy, you see the opportunities around you and the actions you can take to transform your debt to a surplus of money. 3. Use visualization. Spend a few moments every day imagining what you would like to happen. You don't need to spend a lot of time doing this, just a few seconds here and there throughout the day will suffice. See yourself receiving your credit card bill in the mail. See yourself opening it and looking at the balance. It's “$0.00.” No payment is due. Whatever debt you have, no matter the amount, see it as being paid off. Create visual reminders for you to see throughout the day. Maybe a picture of a dollar bill…a person jumping up in the air with joy…whatever image speaks to you and makes you feel happy. 4. Your Heart Energy. Heart energy is a powerful way to speed up the Law of Attraction to get out of debt. Send heart energy to everyone you owe money to. Send it to everyone who works at your bank and your credit card company. Send it to everyone at the store when you make a purchase – groceries, clothing, you name it. See every bill that comes to you as being surrounded in heart energy. Most importantly, send heart energy to money – the money you have, the money coming to you, money everywhere. It will attract more money to you like a magnet. 5. Celebrate. Begin celebrating that you're debt free. Whether you feel like jumping up and down in joy, or saying a silent thank you, celebrate that you're debt is paid off now, as if it were true. Celebrate the little successes along the way as you make each payment, as you pay off a credit card, as you begin to get your head above water. You'll be shifting your vibration to one where you are debt free each time you do so. It's that easy to use the Law of Attraction to get out of debt. First time I read about “Heart Energy”. I say this because I have many times used this energy and now that I’ve been made aware of this I realize I am on the right path.